Did 16th-century astrologer Nostradamus predict the September 11, 2001, terrorist attacks on the World Trade Center and the Pentagon? According to online rumors, the French physician anticipated the attacks in his manuscript "The Prophecies." But the he-told-you-so messages, while intriguing, take some liberties with the truth and should be viewed with skepticism. Nostradamus, the most famous astrologer who ever lived, was born Michel de Nostredame in France in 1503. The alleged seer wrote the first edition of his "Prophecies" in 1555. Each of the book's four-line verses (or "quatrains") purported to foretell world events far into the future. Since Nostradamus' time, the astrologer's devotees have claimed that the man accurately predicted wars, natural disasters, and the rise and fall of empires. Critics, however, argue that Nostradamus wrote his "prophetic" verses in language so obscure that the words can be, and have been, interpreted to mean almost anything. What's more, the interpretations are always done after the fact, with the benefit of hindsight, and with the aim of proving the relevance of a given passage to an actual event. 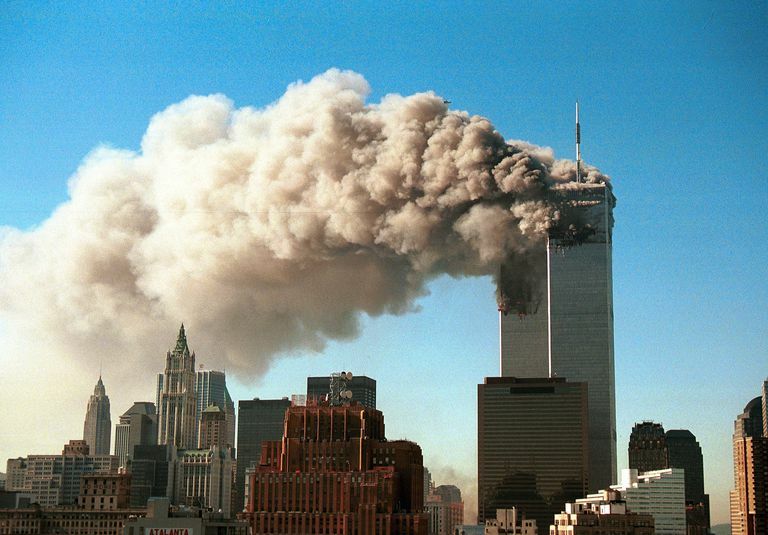 "Spooky" quatrains allegedly foretelling the events of 9/11 with incredible specificity began circulating online within hours of the first jetliner crash in New York City—completely bogus quatrains, as it turned out. In this case, it wasn't a question of whether or not the quatrains were being interpreted accurately. Nostradamus simply didn't write them. Assuming the "City of God" is New York City, then the "two brothers torn apart by Chaos" must be the fallen towers of the World Trade Center. The "fortress" is clearly the Pentagon, the "great leader" the United States of America, and "the third big war" must be World War III. If you're looking for coincidences, these words might seem pretty spooky. But closer scrutiny shows that they raise more questions than they answer. For example, what earthly (or unearthly) justification could Nostradamus have had for describing New York City (which did not yet even exist) as "the City of God"? Why did the great seer refer to the future World Trade Center towers as "two brothers" instead of using a more apt word like "buildings" or "monuments" (or even "towers")? In the end, though, quibbling over individual words is futile, since Nostradamus didn't even write this passage. In fact, Michel de Nostredame died in 1566, nearly 100 years before the date given in the email (1654). The quatrain is nowhere to be found in his entire published oeuvre. In a word, it's a hoax. More precisely, its attribution to Nostradamus is a hoax. The passage was lifted from a web page (long since deleted from the server that initially hosted it) containing an essay written by college student Neil Marshall in 1996 entitled "Nostradamus: A Critical Analysis." In the essay, Marshall admits inventing the quatrain for the purpose of demonstrating—quite ironically, in light of the way it was subsequently misused—how a Nostradamus-like verse can be so cryptically written as to lend itself to whatever interpretation one wishes to make. Here again, though the text features all the pomp and vagueness one finds in Nostradamus' actual writings, this particular passage does not exist, in whole or in part, anywhere in the "Prophecies." This, too, is an internet hoax, a cheeky elaboration on Neil Marshall's invented quatrain. As you can see, Nostradamus made no mention of "two steel birds" in the original passage, nor did he predict that "the undead will roam the earth." As for the geographical location of New York City, it is found at exactly 40 degrees, 42 minutes, 51 seconds north. So, while it isn't false to say that it lies "between 40-45 degrees," it is imprecise, not to mention an obvious, disingenuous ploy to make what Nostradamus actually wrote ("The sky will burn at forty-five degrees latitude") seem germane to the events of September 11, 2001.